Using the latest technology and exclusive ingredients such as Creatine Nitrate, C4 Extreme is more advanced than any other pre-workout supplement. It will ignite your mind, muscles and workouts every time you use it. 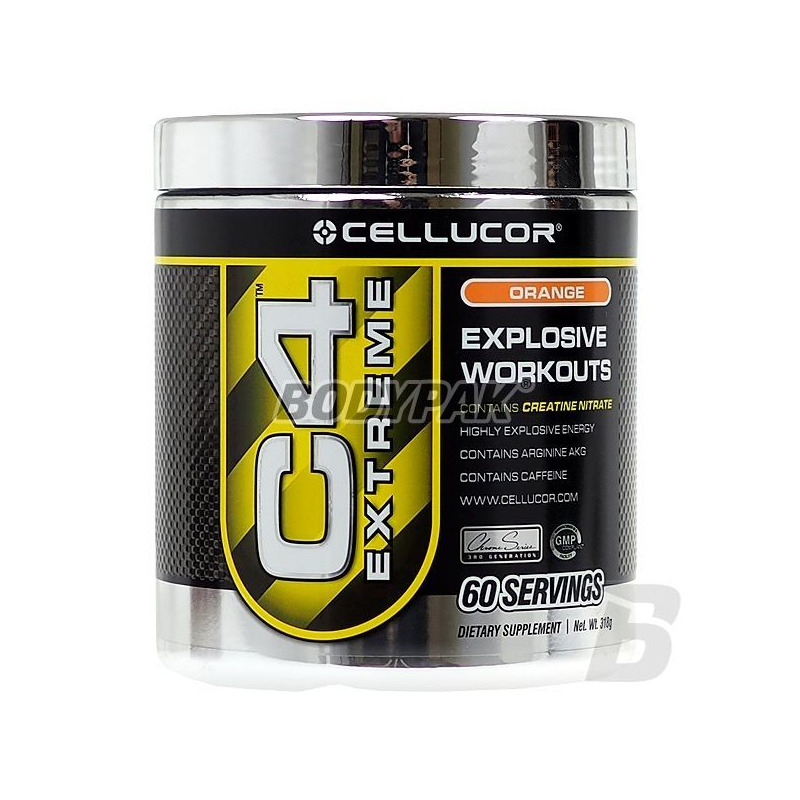 C4 Extreme is pure energy powder. 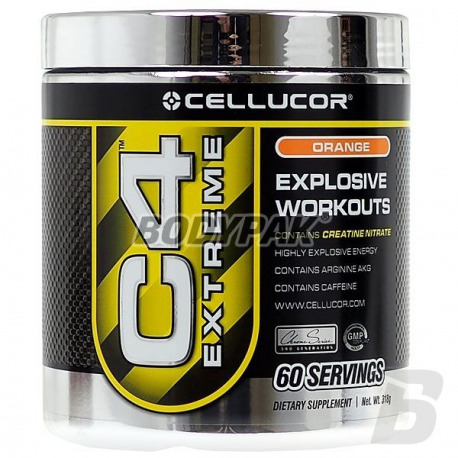 Using the latest technology and exclusive ingredients such as Creatine Nitrate, C4 Extreme is more advanced than any other pre-workout supplement. It will ignite your mind, muscles and workouts every time you use it. Nitrate creatine - is the newest, strongest form of creatine. This patented and unprecedented combination of creatine compound is a molecule of nitric acid, resulting in a highly digestible creatine, which also increases the levels of nitric oxide and the level of ATP in the body. Creatine Nitrate is a very powerful vasodilator; improved muscle blood flow translates into excellent nutrient delivery and unmatched "pump" muscle. Alpha-ketoglutarate arginine (AAKG) - is a potent nitric oxide precursor. AAKG increases blood flow and strength, and the secretion of growth hormone and insulin. This is an effective vasodilator, resulting in improved blood flow, causing the "pump" muscle and more efficient delivery of nutrients to the muscles. N-acetyl-L-tyrosine - is rapidly absorbable and bioavailable form of L-tyrosine, an additive is less prone to urinary excretion. L-tyrosine is an amino acid precursor to the adrenal hormones: adrenaline, dopamine and norepinephrine. These hormones increase the release of HGH and contribute to a higher energy level, concentration and alertness. Puriens Mucuna (Mucuna) - contains L-Dopa, a natural derivative of an amino acid which converts to dopamine in the brain. Dopamine supports growth hormone secretion, one of the most powerful anabolic compounds. Dopamine also converts to norepinephrine in the brain. Norepinephrine increases metabolism and energy levels. Vitamin B12 - methylcobalamin is a potent form of vitamin B12. This greatly promotes cellular metabolism and energy production - helps in the production of fatty acids resulting from the decomposition of fats, which can be easily incinerated. Vitamin B12 also supports the functions of the nervous system and is involved in the formation of red blood cells. Caffeine - a powerful stimulant. It stimulates the central nervous system, it helps to avoid fatigue and increases alertness and energy levels. Folic acid - is a water soluble vitamin B group, which promotes positive mood and higher energy levels. Folic acid also supports the creation of healthy cells and repair them. Niacinamide - niacin or nicotinic acid, also known as vitamin B3, improves joint mobility, muscle strength and function of the nervous system. Reduces muscle fatigue and increases their maximum capacity to work. Synephrine hydrochloride - is a potent stimulator of adrenergic increase energy levels and the synthesis of ATP. Synephrine, although milder, it is structurally similar to ephedrine. This compound increases the adrenergic stimulation and promotes weight loss by increasing fat burning, metabolism and thermogenesis. Vitamin C - is an essential vitamin for human beings, has many health benefits. Vitamin C increases the production of energy, metabolism, and has strong antioxidant properties; strengthens the body's defenses, as it improves the immune system, eliminating free radicals, strengthens bones and connective tissue. Vitamin C promotes anabolism by reducing the levels of cortisol - a stress hormone. Pyridoxal phosphate - commonly known as P5P, is the active form of vitamin B6. P5P does not require conversion in the liver and is therefore the preferred form of the supplement. Vitamin B6 supports several body functions including energy metabolism, neurotransmitter functions and muscle growth and repair. Beta-alanina- is a natural amino acid. Beta-alanine increases muscle carnosine, which raises the energy level, and increases the strength of muscle performance. Beta-alanine effectively reduces fatigue - acts as a buffer, preventing the formation of lactic acid in skeletal muscle (as occurs during exercise), so that you can exercise better and longer. Other ingredients: natural and artificial flavors, silicon dioxide, calcium silicate, citric acid, color (FD & C Yellow No. 6), malic acid, sukraoza, acesulfame K.